It takes a lot for me to willingly be at an airport at 4:00 AM. And yet, with Delta Air Lines brand new A220-100 entering service on a 6:00 AM flight, there I was. Making it’s North American debut, the 109-seat aircraft had an ambitious launch scheduled. 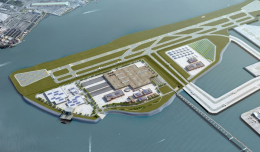 Four round trips would be made between LaGuardia Airport in New York and Boston’s Logan Airport. 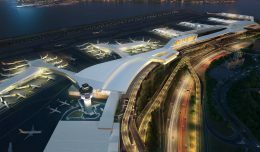 Between LaGuardia and Dallas-Fort Worth International Airport, there would be another 3 round trips made. We were onboard the first and fourth flights of N102DU between Laguardia and Boston. Tickets for this flight were purchased by NYCAviation. Entry into service marked the end of nearly 3 tumultuous years since the aircraft had first been ordered. The initial order for 75 copies of what was then known as the Bombardier CS100 was placed on April 27th, 2016. The order was a big victory for Bombardier, which had been searching for a customer in the United States for several years at that point. At least one previous CSeries order, with United Airlines, had been foiled by Boeing. The had swooped in with an offer of 737-700s at rock bottom prices, undercutting the Canadian airframer. United’s order would be upgauged to the 737-900ER within a couple months. A crowd on the ramp for the A220’s second arrival in Boston. Exactly one year after Delta’s order had been placed, Boeing filed a petition that accused Bombardier of dumping the CSeries for a price far below the cost of manufacturing the aircraft. In a series of proceedings in the following months, the US Government eventually determined that all CSeries aircraft and parts would be subject to duties of nearly 300%. 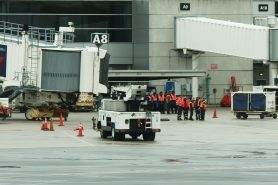 Throughout this process, Delta maintained that it intended to take delivery of the aircraft regardless of the outcome, and that it did not anticipate that it would have to pay any duties. Finally, on January 26, 2018, the US International Trade Commission ruled that US industry was not harmed by the CSeries. The potential duties were overturned. In the midst of all this, Airbus had announced plans to enter into a partnership with Bombardier. The European manufacturer took a controlling 50.1% stake in the CSeries program. They also announced the opening of a second final assembly line in Mobile, AL. Following several months of regulatory reviews, the partnership became official on July 1, 2018. Ten days later, Airbus announced a name change for the program to the A220. Delta took delivery of its first A220 in late October, 2018, and the remaining 3 that are currently in the fleet were all delivered in December. 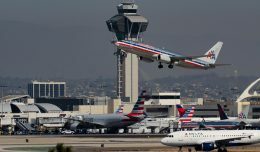 By the end of 2019, the airline expects to have 20 aircraft in its possession. Delta now has 90 A220s on order, including 40 A220-100s and 50 of the larger A220-300. 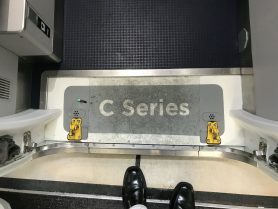 Stepping onboard, one of the first things we noticed was that the plane wants you to know who it was. Emblazoned across the threshold in large gray letters is the word “C Series”. 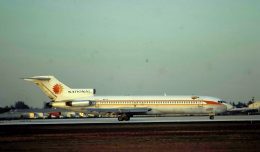 Though we found it odd that the brand new aircraft would have such a branding oversight, it wasn’t the only place we saw the plane’s lineage mentioned. It is fairly clear that the A220 is a small jet that wants to be a big jet. It joins the DC-9/MD-80 family of aircraft as one of the few aircraft types with a 5-abreast layout in economy. However the A220’s cabin is a full 6.5 inches wider than the venerable McDonnell-Douglas planes. Furthermore, the A220 is just 10.2 inches narrower than the Boeing 737. This gives the A220 the widest seat of any narrowbody type, at roughly 18.5 inches wide in economy. However it is not so wide that airlines could squeeze another seat into each row. It is one of many passenger experience wins that we found onboard. That width was certainly appreciated as we settled into seat 12A in Comfort+ onboard the first flight. Even with a window scallop at our elbow, the seat felt spacious, almost to the point of feeling more like a widebody aircraft. In fact, the only thing that made the seat not feel as if we were on a twin aisle aircraft was the curvature of the fuselage towards our head. While headspace was by no means tight, the nearly vertical sidewalls of a widebody are impossible to replicate on a single aisle aircraft. Speaking of the windows, they’re huge! Similar to the Boeing 787 and Airbus A350, the A220 makes heavy use of advanced materials including both composites and aluminum-lithium. This allows the aircraft to use larger windows, just like its twin aisle cousins. Views from inside the plane are very good, even if you aren’t in a window seat. Even with my camera attached to the window with a suction cup, there was still plenty of glass available to use the window. The A220 is one of nearly a half dozen new and upgraded aircraft powered by the Pratt & Whitney PW1000G series of geared turbofan engines. Looking out the window they appear very large for the size of aircraft that you are on, though viewed from the front they appear more reasonably sized. We knew they were quiet. Heck, Pratt & Whitney even told us they were quiet. Even that couldn’t prepare us for how quiet they actually were. While they aren’t silent inside the cabin, they’re pretty close. Even at full takeoff power, there seemed to be more slipstream noise than engine noise. The only time that we noticed engine noise was when they would spool up from idle while on the ground. Then, a loud whirring sound would be heard in the cabin, sometimes loud enough to vibrate the floor. It would only last for a few seconds though, and it would be gone as quickly as it arrived. We did not feel that the sound was obtrusive. 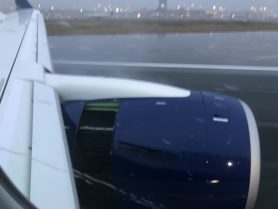 Unlike the hours-long droning of other engine types, the geared turbofan’s only loud noise is isolated to a few seconds. Overhead bin space is surprisingly huge. When opened, the bins stretch all the way to the aisle on the 2 seat side of the plane and nearly as far on the 3 seat side. While this leaves plenty of room for bags, it does impinge on head space while boarding, both while walking down the aisle and climbing into your seat. Travelers should take particular care walking down the aisle if only some bins are open. We saw one unfortunate fellow bang his head on the corner of an open bin, knocking him down. He seemed okay after the initial shock wore off, but it is still something to be careful of. 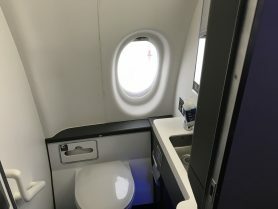 Delta’s 109 seat A220s are generously apportioned with 3 lavatories. What’s more, they are comfortably sized. This is a stark contrast to what has recently been installed on many 737 and A320 family aircraft. There is no contortionist’s act required to use these facilities. While 3 lavatories should keep the lines at bay on board, one of them truly stands out. The aft lavatory on the captain’s side of the plane has an uncommon feature that is usually only found on widebody aircraft: a window. This “loo with a view” allows natural light in and a view out. Don’t expect to enjoy this window seat while you’re sitting though, its over your left shoulder. For those wondering, the window is equipped with a shade like all others onboard. If you’re using the lavatory while still on the ground, we encourage you to close the shade. Nobody wants to see what you’re doing. Each seat has access to a generously sized seatback touchscreen for inflight entertainment. 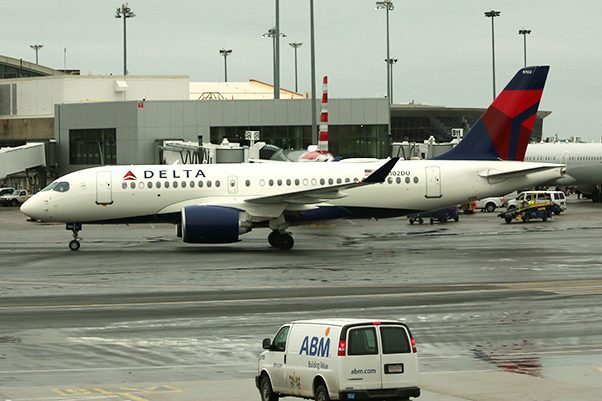 It is loaded with Delta Studio, the airline’s audio visual offering. Movies, TV shows, music, and live tv are all complementary for everyone onboard. Unfortunately, now that Richard Anderson has departed Delta, “The Big Lebowski” is no longer available. WiFi is available for a fee, though there is a free messaging only plan. One highlight of the inflight entertainment system that is sure to please the enthusiast crowd is the moving map. Gone is the scrolling feed of your airplane on variously scaled maps. 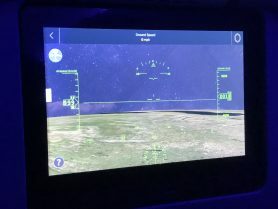 The A220’s implementation, provided by IFE manufacturer Collins Aerospace, uses 3D maps of various types, which are movable by simply touching the screen. Most notable was the so called ‘window view’ which gives a simulated flightdeck view. Heads-up-display style instruments are visible by default, but you can turn them off. As stunning as the inflight entertainment system is on the surface however, a deeper dive reveals several flaws. Some of these might have just been issues with how the system was set up by the crew. Others were obviously related to the system’s software or integration with the aircraft. Many of these were confirmed to affect multiple aircraft on multiple routes. We will try to focus more on the issues that seemed to be with the system, while avoiding nitpicking. Telemetry data (airspeed, altitude, etc) was one area that we noticed deficiencies in. The moving map (window view) system often disagreed with the rest of the IFE system. Displayed altitudes varied by several hundred to as much as a thousand feet consistently. Velocity on the window view never displayed anything other than a default value, while being reasonably accurate on the rest of the system. Giant plane syndrome was present on the moving map. At times, the plane appeared as large as a state when the map was zoomed in. It wasn’t very good for seeing where you really were, particularly on a short haul flight. There also seemed to be a bug with what time was displayed, with the default seeming to be GMT. Sometimes it was updated to local time quickly, other times it wasn’t. In all, the system was very usable, but the issues with the moving map system turned a potentially awesome feature into not much more than eye candy. There was also a surprising lack of consistency in the IFE system about whether the plane was an A220-100 or a CS100. Hopefully they can easily be solved with a software update. As a larger flyer, I found the armrest-mounted tray table to be suboptimal. Even for a smaller traveler it was tricky to deploy, with the table release located close to one’s elbow. Once deployed and slid all the way forward, I still had to move around in my seat a good bit before it would drop flat in front of me. Once it was flat, it continued to press against me until I reversed the process and stowed it later in the flight. Overall, the A220-100 is a fantastic aircraft. Despite a few relatively minor flaws, it was excellent all around. 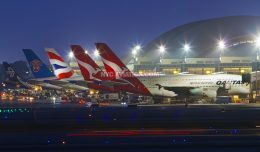 It is so good in our opinion that we would actively look to book flights on routes it is assigned to. And with 16 additional aircraft due for delivery this year, that route map will grow quickly. We anxiously await not only Delta’s future deliveries, but deliveries for JetBlue (and possibly startup Moxy) in the future.